Chocolate rules with 5X the number of searches of the next term: fruit snacks. Moms may have gotten healthy, but they know their kids! Lindt was the top brand searched. 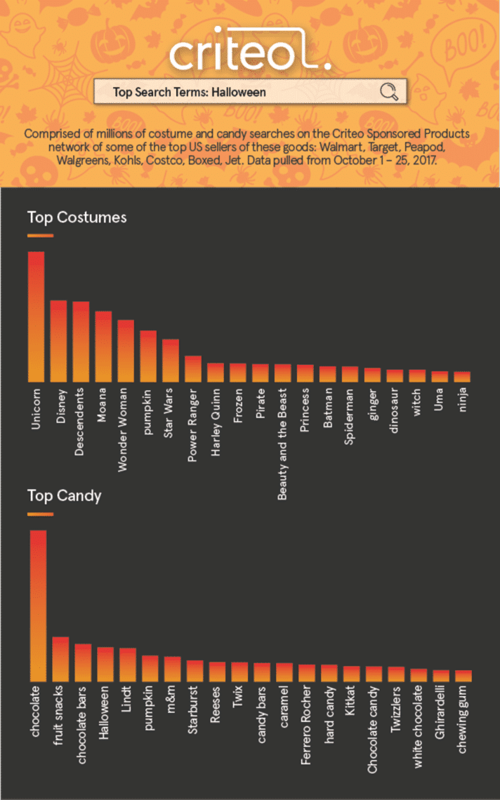 Are adults buying for themselves as well as for trick-or-treaters? M&Ms is the top mass market brand of chocolate represented, followed by Reese’s and Twix. Unicorns crushed superheroes – and they didn’t make the list last year. The term had 60 percent more searches than the next term, Descendents. Unicorns represents a broad trend among kids and adults, with unicorn merchandise and even hair styles abundant. It’s partly related to resurgence of My Little Pony – which is a big deal among hipster guys (Bronies) as well as GenZ. Moana was Disney’s summer launch for girls and it scored big at Halloween, not only the box office—but Wonder Woman was close on her heels. Harley Quinn is another new one to the list: scary DC Comics villainesse. Frozen maintains its ranking, while Uma, a Descendent, is another character to make the list for the first time. Get more shopper insights from Criteo’s 2017 Shopper Story here!